In Porterville CA, Garage Door Repair and Installations Company is on call 24 hours a day, 7 days a week to offer honest, dependable garage door repair and garage door installation. We service not only the Porterville, CA area but also the surrounding areas including Visalia CA, Hanford CA, Tulare CA, and Exeter CA. Give us a call and have your garage door repaired by the Porterville experts. With over two decades of experience in the garage door industry, and a proudly Veteran Owned Business, we provide only the highest quality service and professionalism in each and every service call. Offering both Same Day Service and 24/7 Emergency Service, we provide residential and garage door service across the Porterville CA area and beyond. We are able to repair all makes and models, and our work trucks are stocked with any part we may need. At Garage Door Repair and Installations Company we realize that for a homeowner, their home is the biggest investment in their life. Upgrading your Porterville home with a new garage door can improve the beauty and value of your home. With so many styles to choose from these days, a new garage door from Garage Door Repair and Installations Company in Porterville will give you functionality and a look that will last for years to come. The decades of experience acquired by the professionals at Garage Door Repair and Installations Company allow us to provide garage door repair that saves both time and money. With technicians that show up to our appointment on time, even in emergency circumstances, we help our customers turn a stressful situation into a satisfied one. 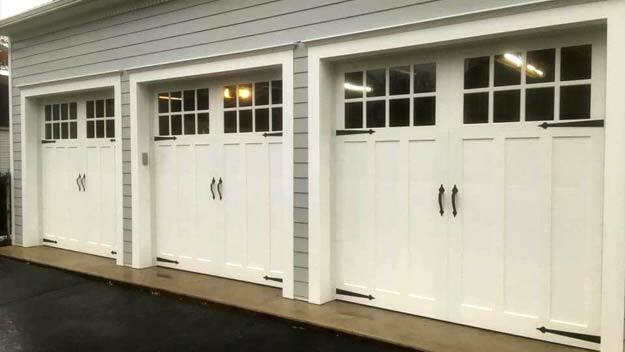 The garage doors of Porterville are made up of all designs, brands, and models. Our team is trained to work with all makes and models. If your Porterville home or business needs garage door repair, garage door maintenance, or garage door installation, you have come to the right place and can trust the professionals at Garage Door Repair and Installations Company. Garage door springs are the part of a garage door that breaks the most often. We all refer to it as garage door spring repair, but there is truly no way to repair a spring. Once a spring breaks, it is simply broken. What we are really doing when a spring breaks is replacing the broken spring. Springs are only designed to only designed to turn a certain number cycles before they break. Therefore, it is inevitable that everyone will need garage door spring replacement periodically. Each size and type of spring will have a number of cycles it can perform. Our garage door repair company only installs high quality springs that will provide use over an extended period of time. Our prices on garage door spring replacement are the best in all of Porterville. When you need garage door spring repair, call us for a quick and easy estimate. Get your FREE ESTIMATE for your garage door service today.